Every time I eat lentils, I remind myself that I should be eating them way more often. Not only are they chock full of nutrients, like iron, B-vitamins and plant-based protein; but they’re delicious, cheap, and cook up quite quickly. While we always seem to have lentils at home, they’re often overlooked in favor of seemingly more exciting options. That is, until this Curry Lentil Salad showed up. It’s hearty, delicious, and bursting with flavor - because even lentil salads deserve to be exciting. Most lentil salads feel like side dishes. And that’s exactly how I wanted this dish to be different. While you could by all means eat this Curry Lentil Salad as a side, it truly does eat like a main. 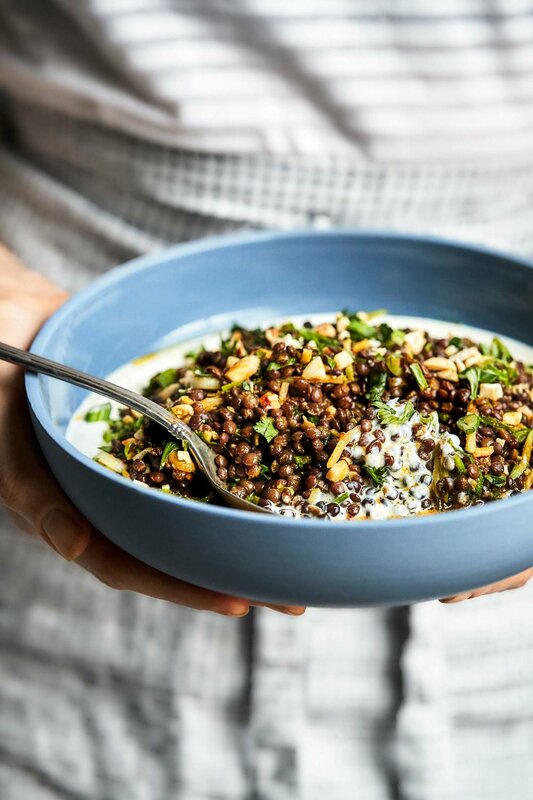 In less than 30 minutes, you’ll have perfectly cooked beluga lentils, tossed in a fragrant curry vinaigrette. Crunchy apples, toasted cashews, fresh herbs, and a bed of creamy yogurt make this dish anything but basic. For a little extra something-something, you could also toast up some naan bread and use it to mop up leftover sauce. Because it’s so good you won’t want to leave a single drop behind. Enjoy this dish for a weeknight dinner, and get excited about packing up any leftovers - because they might even taste better the next day. There are a lot of different types of lentils available and each is unique in its own way. For this dish, black beluga lentils are highly recommended. They’re firmer than most other lentils, and keep their shape even after being tossed in vinaigrette. They’ll hold up for a couple days in the refrigerator, without turning to mush, which means your leftovers will taste just as good (if not better) than the day before. You can typically find beluga lentils in the bulk aisle, or at the very least, in tall clear bags stocked in the legumes/grain section of your store. While beluga lentils aren’t quite as common as red or green lentils, they’re worth finding. If you’ve never given them a try before, I’ll bet they become one of your favorites. The hardest part about this recipe is making sure you have the right spices on hand. And to be honest, that’s not too hard at all. You’ll probably already have most of the spices needed, and if you’re missing some, do your best to add them to your collection. You’ll use them time and time again. Since Indian cuisine is often loaded with unapologetically punchy flavors, this curry vinaigrette is no different. You’ll be surprised at how it transforms ho-hum lentils into a bright, flavorful dish that’s anything but boring. When serving up the lentils, make sure you scoop up any extra dressing and pour it on top. The extra vinaigrette that pools into the creamy yogurt is one of the best parts! Rinse and strain beluga lentils. Transfer rinsed lentils to a pot filled with enough water to cover lentils by 2-3 inches (5-7 cm). Bring to a boil. Once boiling, reduce to a simmer. Cover with lid and cook for 15-20 minutes, or until lentils are tender (do not overcook). Once cooked, strain lentils and rinse under cold water to stop the cooking process. Shake well to strain excess water. Meanwhile, assemble dressing. Combine olive oil, apple cider vinegar, maple syrup, Madras curry powder, dijon mustard, cumin, salt, cardamom and cayenne pepper. Whisk well, then set aside. Toast cashews on a skillet set over medium-low heat. Stir regularly to ensure even cooking. Remove cashews from heat when they’re golden brown (approximately 5 minutes). Give them a rough chop, then set aside. Then, use a knife or mandoline to cut the (unpeeled) green apple into matchstick-size pieces. In a large bowl, combine cooked beluga lentils, vinaigrette, and fresh lime juice. Toss until the lentils are well coated. Add green apple, cilantro and green onions. Gently toss until combined. To serve, smear yogurt on the bottom of a plate or bowl. Top with lentils, then garnish with toasted cashews.